Mariupol sector stands as theatre of fiercest hostile attacks in the combat zone. Over the last day a combat engagement and intense use of heavy weapons are registered there. Yesterday in the combat zone the situation escalated in the Mariupol sector, number and intensity of attacks from heavy weapons increased, said Colonel Oleksandr Motuzyanyk, spokesman of the Ministry of Defense of Ukraine on ATO-related issues at a press-briefing at Ukraine Crisis Media Center. “Almost 200 mines and over 40 artillery shells were fired upon Ukrainian positions. Most intense attacks took place between 8 a. m. and 12 noon,” said the spokesman. In the evening between Slavne and Olenivka there was a combat engagement between Ukrainian troops and Russia-backed militants, the engagement lasted an hour. In Novotroyitske militant sniper fire was registered. There was a series of incidents of fire exchange between Ukrainian troops and Russia-backed militants in Mariinka as the day started and ended. In the Donetsk sector there were four long-lasting attacks. “Adversary violated ceasefire in Mayorsk, Avdiivka and Opytne. Sixteen mortar mines were fired upon the positions of Ukrainian troops. Ukrainian troops are returning fire,” said Colonel Motuzyanyk. It was quiet at the Svitlodarsk salient. In the Luhansk sector combined Russian-militant troops violated ceasefire six times, incidents of violence took place in Orikhove located at the Bakhmutska road and outside Popasna. Militants used mortars twice. It was quiet outside Stanytsia Luhanska and in Novoaydar. 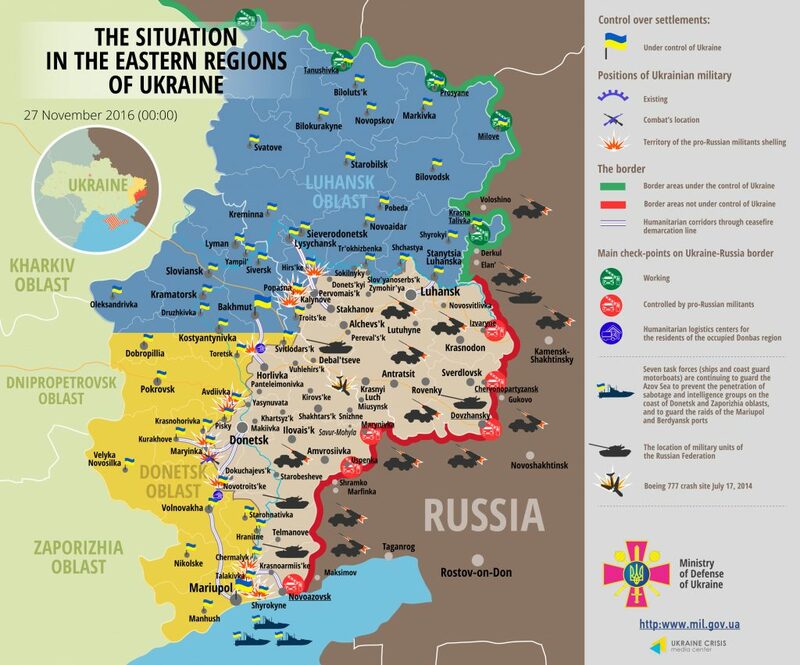 Ukrainian troops incurred no lethal casualties over the last day, two servicemen were wounded in action. One more serviceman was wounded as the truck hit a hostile mine. Moreover a civilian in Mariinka hit a grenade. “According to preliminary data the incident occurred when the man opened the door to the house of his friend that appeared to be mined. The wounded civilian is currently in hospital in Kurakhove,” elaborated Colonel Motuzyanyk. In Myrnohrad, Donetsk region, law enforcement staff detained a militant nicknamed “Nazi”, resident of Pokrovsk. In 2014 he was standing guard at a militant blockpost with weapons and took part in seizure of a police station. Before the war started he already had a criminal record for robbery and was undergoing a treatment course for drug addicts. Several cases of weapons smuggling were detected. About 700 ammunition pieces were discovered from a man at a checkpoint in Mariupol, he was trying to bring them out of the combat zone. “Another perpetrator was discovered at a local bus station, he was carrying about 100 ammunition pieces with him. Law enforcement staff is investigating into the origin of the ammunition in question,” noted the spokesman. In Mariupol policemen also discovered an RPG-26 grenade launcher in an abandoned house.